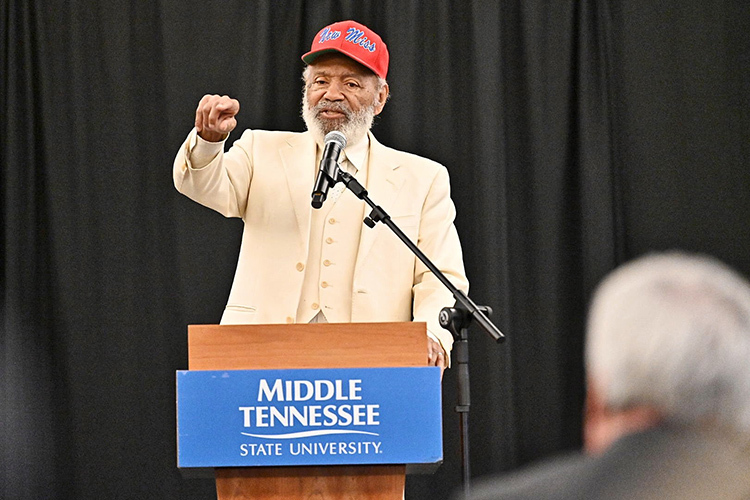 Tips on Staying Healthy During..
MTSU Took Me to Grammy Week an..
That was the immediate reaction of James Meredith himself to an introductory video encapsulating the events of his life, shown Thursday, Feb. 14, at MTSU’s 23rd annual Unity Luncheon in the Student Union Ballroom. 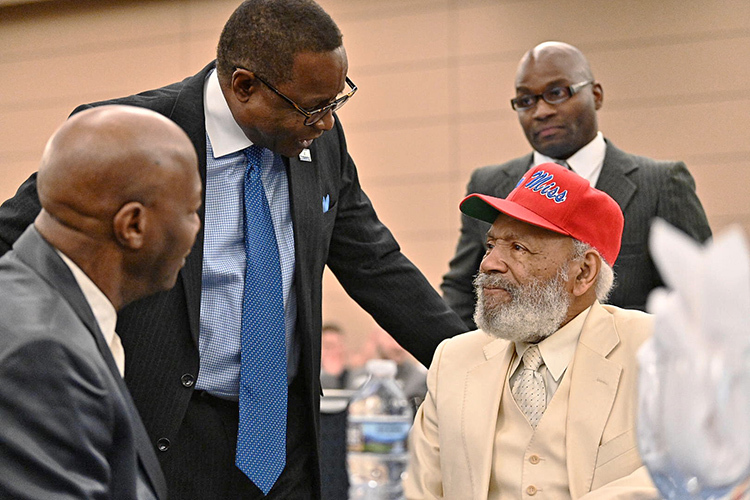 The annual tribute to local “unsung heroes” of color honored five people who have made notable contributions in the areas of community service, excellence in sports, black arts, education and advocating civility. Meredith, who became the first African-American student at the previously all-white University of Mississippi in 1962, delivered the keynote address. As he discussed the history of his ancestors, which includes white and Native American people, the 85-year-old Meredith likened the drive for civil rights to a wedding compact that requires commitment to both man’s and God’s laws. “The legal paper provides the legal right and responsibility of the two parties, but it is a true marriage only when the legal terms of the contract are carried out in love leading to and maintaining the marital relationship,” Meredith said. Again referring to the Biblical teaching that “the meek shall inherit the earth,” Meredith cited poverty and the failure of people to alleviate it as a pathway to unfair treatment in society. • Martha Bigsby, a retiree from Nissan’s Smyrna assembly plant, recognized for her community service. She was honored for her volunteerism with Journey Home and the City of Murfreesboro’s National Night Out, her lengthy service as a member of the NAACP Executive Board and an NAACP Silver Life Member, and her membership and service with Providence Missionary Baptist Church. • Carolyn Sneed Lester, founder of the first Juneteenth Celebration for Murfreesboro and Rutherford County, honored for her contributions to black arts. She has participated in more than 20 plays at the St. Clair Street Senior Center and the Murfreesboro Little Theatre and also is a charter member of the National Museum of African-American History. • Rickey Field, a physical education teacher, assistant football coach and head track coach at Riverdale High School, lauded for his excellence in sports. His community work also includes service with Big Brothers and Big Sisters of Middle Tennessee, the Fellowship of Christian Athletes and the American Alliance for Health, Physical Education, Recreation and Dance. 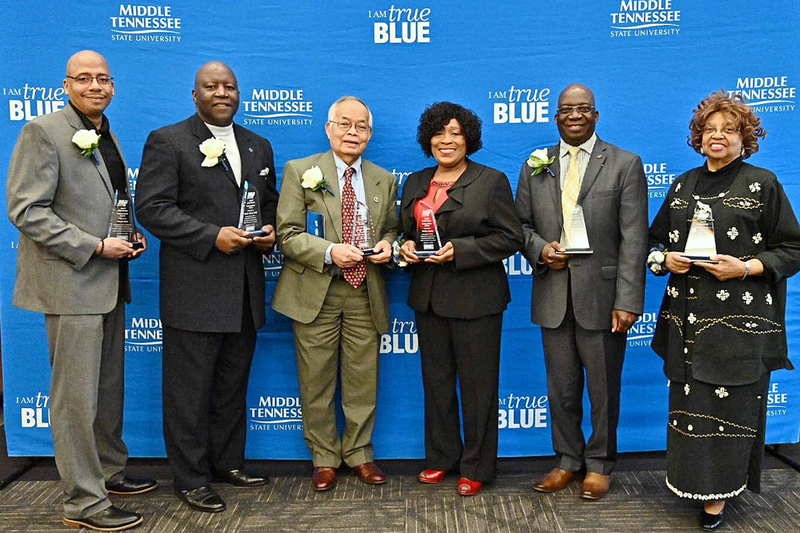 • Dr. Frank Michello, a professor of finance at MTSU and director of the Master of Science in Finance program in the Jennings A. Jones College of Business, honored for his service to education. Michello’s research interests include emerging markets, financial accounting, market microstructure and risk management. He is a naturalized U.S. citizen who was born in Zambia. • Chantho Sourinho, a Rutherford County commissioner, recognized as an advocate for civility. A naturalized U.S. citizen born in Laos, Sourinho serves on the boards of several organizations, including Main Street Murfreesboro, Read to Succeed, the Wat Lao Buddhist Temple and the Rutherford County Health and Wellness Council. He is retired from the Rutherford County school system. Jimmy Hart, director of MTSU’s Office of News and Media Relations, received a special award as an unsung hero of the university. MTSU President Sidney A. McPhee said he always looks forward to this particular Black History Month celebration. “You don’t see these individuals on the front page of the newspaper or on the networks, but they make the community what it is,” McPhee said. 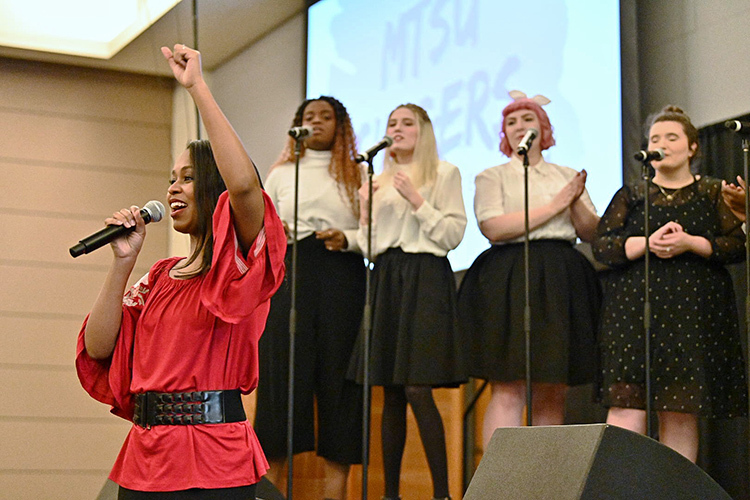 Thursday’s luncheon also included the performance of two selections by the MTSU Singers, an audition-only ensemble directed by Dr. Cedric Dent, a School of Music professor who also is a member emeritus of the eight-time Grammy Award-winning vocal group Take 6.